Isaiah 49:12 Behold, these shall come from far; and behold, these from the north and from the west; and these from the land of Sinim." Ezekiel 29:10 therefore, behold, I am against you, and against your rivers, and I will make the land of Egypt an utter waste and desolation, from the tower of Seveneh even to the border of Ethiopia. Ezekiel 30:6 Thus says Yahweh: They also who uphold Egypt shall fall; and the pride of her power shall come down: from the tower of Seveneh shall they fall in it by the sword, says the Lord Yahweh. se-ven'-e, se-ve'-ne (ceweneh): For the King James Version "the tower of Syene," in Ezekiel 29:10; Ezekiel 30:6, the Revised Version (British and American) reads, "the tower of Seveneh," with a marginal note, "or, from Migdol to Syene." Seveneh is the town at the First Cataract in Egypt, now known as Assuan. Fresh interest has recently been given to it by the Elephantine discoveries bearing on the ancient Jewish colony and temple of Yahweh in that place in the 5th century B.C. 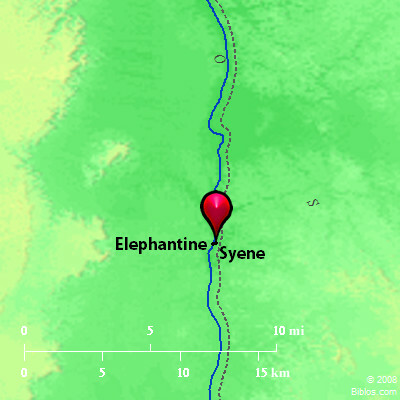 SYE'NE, a frontier city of Egypt bordering on Ethiopia, and upon the e. side of the Nile, now Assouan, or Aswan, nearly 500 ms. e. of the Mediterranean.